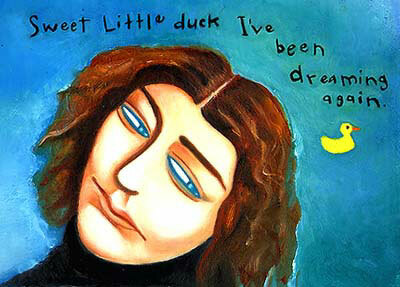 t's girly music," warned my workmate as she slipped me a Patty Larkin disc I'd never heard. "Hey," I allowed, recalling a lifelong love for songstresses of many stripes, "I like girly music." So last month, when Larkin and Kathleen Edwards showed up at Portland's Aladdin Theater within a few nights of each other, it offered a perfect chance to see two singers give girly music a good name. Edwards is 24, Canadian and feisty, deals mostly in rough-hewn roots rock, sports a hot CD and likes to shoot her dirty mouth off. She's this year's it-girl. Larkin, Midwestern and more than twice Edwards' age, has a great gift for melodic modern folk. She's lived on both coasts, plays a muscular acoustic guitar and sings with elegant grace. But just like there's obviously much more to any woman than a thumbnail sketch, Edwards and Larkin have things in common well beyond a winning way with words and music, strong instrumental chops and distinctive voices. Both featured a sharp band, keen political observations and a disarmingly natural presence on stage. Neither filled the 660-seat Aladdin. And each has a serious problem. Edwards' dilemma is how to live up to everyone's expectations  the least of which are probably not her own. Since January, when Failer was released, the media machine has cranked itself up to somewhere near a fevered pitch. Rolling Stone proclaimed Edwards one of its 10 artists to watch in 2003. Portland's Oregonian featured her on the cover of its weekly A&E magazine. David Letterman twice had her as a guest within a matter of weeks (Edwards is said to have told a Minneapolis crowd that it must have been the blow jobs). And the album, if not uniformly great, is solid and thoroughly enjoyable, with glimpses of true brilliance. On stage, Edwards is gangling yet graceful, foul-mouthed but charming, winsome and wise beyond her years. And it's undeniably exciting to witness someone just as their performing skills come to full flower. More than once she cocked an eye toward the Aladdin's far wall as if channeling some divine wisdom. Several times, while strapped to a guitar and rounding out a convincing quartet, she sidled up face-to-face with her lead guitarist as her countenance gave way to an unabashed grin. On the album, the rollicking "Westby" neatly wraps the ambivalent post-affair feelings of a drunken motel tryst with a married older man into a neat, humor-laced 2:27 package. "... and if you weren't so old I would probably keep you," she sings, "and if you weren't so old I'd tell my friends. But I don't think your wife would like my friends." By song's end the geezer snoozes while the protagonist pockets a gold watch off the bedside table  bored with the cable TV and presumably headed for the door. Even if the watch ends up fake, one guesses, Edwards could probably glean some humor from that, too. The song's in-concert version agreeably accomplished the old Bob Dylan trick of radically recasting the arrangement of perhaps her catchiest number. Elsewhere, in a display of versatility, Edwards soloed on the wistful "Sweet Little Duck," a bittersweet ballad that captures the opposite, somber side of a doomed relationship. In "Hockey Skates" she takes her hometown Ottawa music scene to task. "Do you wish that the lights were brighter in the city that you live?" she asks. "We can talk like we are friends," she sings a bit later, "going over it all again, talking 'bout everything I am doing wrong. Do you think your boys club will crumble just because of a loud-mouth girl?" Neither did Edwards, classically trained on violin and daughter of a diplomat, back down from a world at war. "It's not over," she said, "but you can all come to Canada when they start up the draft." That's the refreshingly brazen sort of attitude that can produce problems of its own. 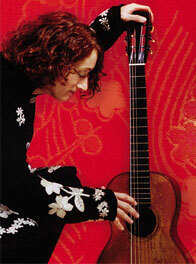 Patty Larkin: Ten albums since 1985. A few nights prior, Larkin was equally unafraid of current events: "Eighty billion dollars," she said in a remark that still holds true as of this writing, "and all we know for sure is that there's one less statue of Saddam Hussein in Baghdad." But Larkin has a different kind of problem. Ten albums into a solid and cult-producing career, her latest release, Red = Luck, doesn't match Regrooving the Dream, the gem from a few years back. Still, the recent CD yields enough strong material to anchor the current tour. The melodic "All That Innocence," "Too Bad" and "Home" could fit snugly on Regrooving, while a night's worth of Marc Shulman's inventive lead guitar lines attached degrees of sheer excitement to Larkin's sure-handed strums. Still, Larkin seemed determined to deliver a satisfying, well-rounded set  which included several well-spun between-song yarns. At one point she asked how many people had heard her live-on-Portland-radio performance earlier in the day. "Hmm," she mused following a smattering of applause, "so much for the marketing campaign." That worldly-wise and easy-going demeanor is no accident. Preceding many years of touring, Larkin grew up in a musical family, earned a degree in English lit from the University of Oregon, then studied at Boston's prestigious Berklee College of Music. Clearly, she has nothing to prove. So no matter how you slice it, both Edwards and Larkin have the kinds of problems that most would envy. If Larkin ever tops Regrooving, she may yet end up a household name. 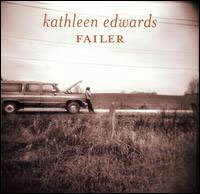 And if Edwards even matches  much less surpasses  the current album with her next release, well, clearly the sky's the limit. Meanwhile, any of us with even the slightest leanings can enjoy what they've already accomplished in the great good name of girly music.